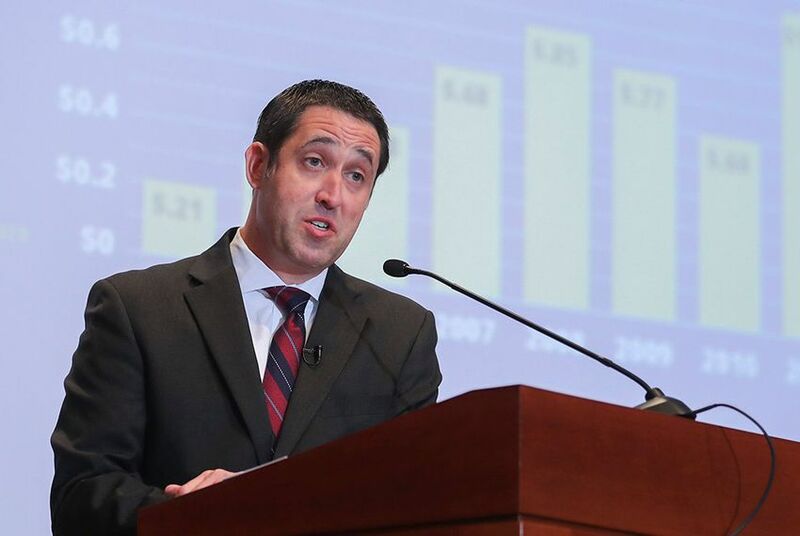 If Comptroller Glenn Hegar’s latest revenue estimate is to be believed, Texas budget writers awoke Wednesday morning to a $2.8 billion present. Thanks to Texans’ ravenous purchasing appetite — and all the sales tax dollars collected on those purchases — the state has seen bigger revenue growth in 2018 than officials predicted last year. With help from rising oil prices and production, state lawmakers are on track to have more than $110 billion to spend on the two-year budget, according to the comptroller. That’s an upward revision of about 2.6 percent from the roughly $107 billion Hegar estimated in October, meaning lawmakers could have nearly $3 billion more to work with next year. That forecasted revenue could go a long way toward plugging some of the huge holes that have worried lawmakers since they signed off on their last two-year budget at the end of the 2017 legislative session, such as a $2 billion underfunding of the Medicaid program for the poor and disabled, a $2.5 billion annual commitment to the state highway fund and the continued costs of Hurricane Harvey recovery. In a letter to Gov. Greg Abbott and other state leaders, Hegar said Texas was in the midst of an “economic expansion exceeding our expectations,” resulting in robust job growth. “Texas in particular benefited from rising oil prices and production and the consequent increase in economic activity,” he wrote, noting the state added more than 350,000 new jobs in the last year. Lawmakers and Capitol observers have fretted for months over a potentially dismal fiscal outlook for next year. In March, Hegar warned that the state could face a credit-rating downgrade if lawmakers didn’t come up with funds to address significant future liabilities, such as state government pensions and a health care program for retired teachers. The revenue numbers could still change between now and January, when the comptroller will issue a new estimate that will determine how much lawmakers may spend on the two-year budget they craft in 2019. State Sen. Jane Nelson, a Flower Mound Republican who chairs the Senate’s budget-writing committee, received Hegar’s new estimate with cautious optimism. Hegar predicted lawmakers will also have nearly $12 billion at their disposal next year in the state’s Economic Stabilization Fund, a pot of money available for budget emergencies, better known as the Rainy Day Fund. That’s the largest “ending balance” in the fund’s history, according to the comptroller. Still, Hegar’s forecast warned of possible threats to the state’s economic health. Policy changes by the Trump administration — such as threats to withdraw from the North American Free Trade Agreement and the current escalation of tariffs on goods from other countries — could be a major blow to Texas exports and “could harm some of our state’s leading industries while slowing our economic growth,” Hegar wrote. Outgoing House Speaker Joe Straus also cautioned that international trade wars could harm the state's budget. "While today’s report from Comptroller Hegar is good and welcome news, he also importantly reminds us of the potential negative effects of tariffs, trade wars and the significant role that international trade plays in the Texas economy," Straus said in a written statement. "In spite of the positive report, budget writers in the 86th Session will have to deal with multiple challenges."